McLaren will launch two special edition 12C and 12C Spider models to mark 50 years of the brand with a very limited-run worldwide production. When an automaker celebrates their 50th anniversary, they need to do it in a big way, or in the case of McLaren, with a small limited production run. McLaren has announced they will be launching two special edition models to celebrate five decades of race-winning technology and expertise. The British brand will be building just 50 examples each of the anniversary edition of the groundbreaking 12C and 12C Spider. The 100 supercars will feature unique styling and specification enhancements that will set them apart from the standard models. The British sports car maker will celebrate on September 2nd to mark 50 years of the brand. The two supercars will be specially designed by the McLaren Automotive design team led by Design Director, Frank Stephenson, and produced by McLaren Special Operations (MSO), the division of McLaren Automotive who is responsible for the delivery of bespoke projects for the brand. To mark the milestone event, McLaren will feature the 50 12C and McLaren 50 12C Spider models with a number of enhancements. Those upgrades will include a remodeled, CFD (Computational Fluid Dynamics)-optimised front bumper from MSO, which McLaren says will provide increased levels of front downforce. There is more carbon fiber on these special-edition models on the lower section of the color-coded bumper, framing the air intakes. And the front floor is also made of a special race-derived carbon Kevlar. On each hood they will be fitted with a black McLaren F1-inspired heritage badge. Underneath, to enhance the stopping power, the McLaren 50 12C and 12C Spider models are fitted with carbon ceramic brake upgrades, with 394x36mm discs at the front, and 380x34mm at the rear. They can be seen poking through the unique Satin Black McLaren 50 Ultra Lightweight wheels. The 19-inch wheels on the front and 20-inch at the rear offer a combined weight reduction of 2kg (4.4 lbs) over the optional Super Lightweight wheels. The special edition anniversary models also get upgrades to the cabin. The 100 examples will get a full leather upgrade, special branding on the fibre sill panel and floor mats, and an anniversary dedication plate on the driver’s door to commemorate the limited run models. Outside, three new colors will be offered, Carbon Black, Supernova Silver or heritage McLaren Orange. Each of the McLaren 100 limited edition models will come with a monogrammed black and silver car cover, limited edition key, carbon fibre presentation key box and a specially commissioned print signed by McLaren Automotive Design Director, Frank Stephenson. 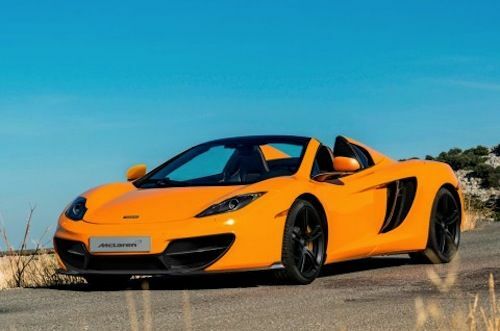 These 50th anniversary McLaren 12C and 12C Spider models will be fast. Many automakers also limit their convertible models performance numbers, but the 12C Spider offers the same identical engine specs as the fixed-roof coupe version. It gets the same revised 616 horsepower 3.8-liter V8 twin-turbo powerplant. It will accelerate from 0-62 in just 3.1 seconds and has a top track speed of 204 mph. If you want one of these 50th anniversary McLaren 12C and 12C Spider models, they will come with a premium price. The recommended retail price in the UK for the McLaren 50 12C is £196,000 ($297,351), and £215,500 ($326,176) for the McLaren 50 12C Spider.